The Soleus CFM25E is a very similar dehumidifier to the Soleus 40 pint CFM40E. While less powerful than the 40 pint model the CFM25E will give good service in smaller areas of the home, extracting up to 25 pints of water per day. In common with its larger cousin the CFM25E it is quiet in operation and can work in cold temperatures, as low as 36°F. With identical features to the 40 pint model the CFM25E has everything needed in a home dehumidifier. The fitted caster wheels and a top mounted carrying handle make the Soleus CFM25E truly portable. At only 27 1/2lbs it is even easier to move than the CFM40E. 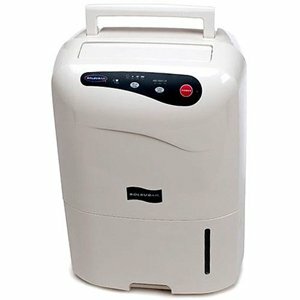 It is also exactly the same size making it among the more compact dehumidifiers in its class. The Soleus CFM25E is equipped with an adjustable humidistat with which the desired level of relative humidity (RH) may be set. The range of the humidistat is a little limited at 50-70% RH and can only be adjusted in 10% increments. Nevertheless this feature is an advantage not offered by all dehumidifiers. It saves energy since the machine does not operate once your pre-set RH level is reached. This feature also prevents excessive drying which can cause discomfort to people and damage to property, especially items made with wood or leather. The Soleus CFM25E also has a very effective auto-defrost function. It often comes as a surprise to some people that ice can form in a dehumidifier when the room is no colder than 65°F. This is caused by the way a dehumidifier works. Air is passed over "refrigeration coils" and condenses on the cold metal of the coils. These coils are very similar to the ones in your refrigerator and at apparently quite warm temperatures ice can form on them. With auto defrost the temperature at which ice forms can be much lower and as a result the CFM25E can continue operating down to a very low 36°F. This feature means that the dehumidifier is capable of effective operation in the coldest parts of the house, a basement or garage for example. It is important to remember that this machine has quite a small water extraction capacity compared with some other home dehumidifiers and its ability to operate at low temperatures does not mean that it will be able to dehumidify anything other than a small area. A larger capacity dehumidifier will cost more to buy, and use more electricity per hour, but may compensate by running for fewer hours per day. It may also be possible to run a more powerful dehumidifier at a lower fan speed which is quieter and saves more electricity. For a small space, however, this is an entirely suitable dehumidifier. While some customers report faultless performance over several years a significant number have had problems with this machine and after sales service has been poor on a number of occasions. Consumer reaction to the Soleus CFM25E is very favorable or favorable from about 80% but the other 20% have had poor experiences.